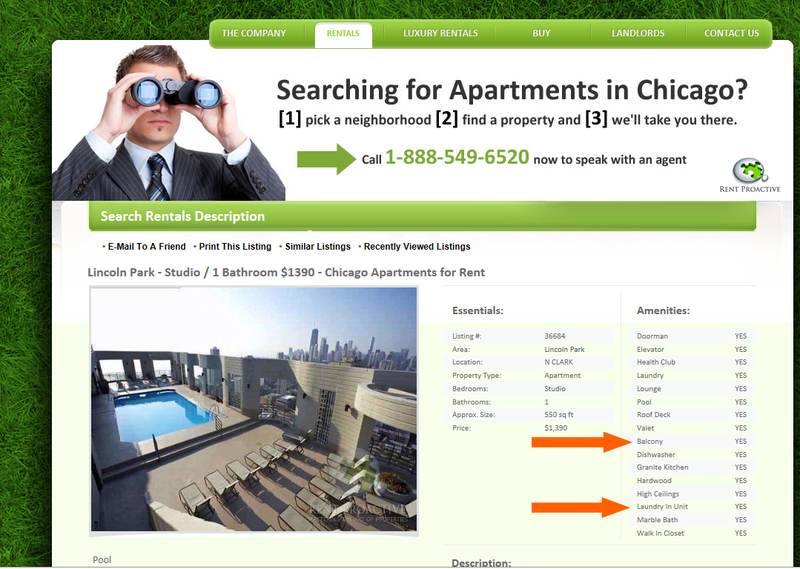 You’ll find scores of sleazy rental services on YoChicago’s do-not-call list. In the coming weeks we’ll single out twelve of them – the dirtiest dozen – for special attention. Our criteria for inclusion in the dirtiest dozen are somewhat arbitrary. Our goal is to document Chicago rental services’ extensive illegal online behavior and seek meaningful sanctions as a result. That necessitates a focus on companies with a large online presence, but we may single out some smaller companies that behave outrageously, and we may zero in on an individual or two. We’re aware that the offline behavior of Chicago rental services is often atrocious, but it’s difficult for us to document in a way that results in action. Over the weekend we took a closer look at Rent Proactive, the first entry on our dirtiest dozen roster. Rent Proactive earned that spot by being one of Craigslist’s most prolific spammers during our occasional checks, with more than 2,000 ads per week. By awarding the #1 spot to Rent Proactive, we don’t mean to suggest that it’s the dirtiest of the dirtiest dozen. It’s a contender, with some tough competitors vying to be the dirtiest. If you take a closer look at the above screen cap from Rent Proactive’s website you’ll see some of the rogue behavior you can expect from the dirtiest dozen. Rent Proactive has, it appears, added its own watermark to a photo copyrighted by Eugenie Terrace’s management company. Rent Proactive’s ad is for an apartment community that doesn’t authorize rental services to advertise. Rent Proactive’s ad tells you there’s laundry in the unit – Eugenie Terrace doesn’t offer in-unit laundry. The ad tells you the unit has a balcony. Studios at Eugenie Terrace don’t have balconies. High ceilings? Nope. Walk-in closet? Not in this floor plan. Rent Proactive’s Craigslist ads for Eugenie Terrace say the building accepts dogs. It doesn’t. Honest mistakes or dishonest bait-and-switch? We will monitor the online behavior of the dirtiest dozen, thoroughly and repeatedly document instances of illegality, and file disciplinary complaints with the Illinois Department of Professional and Financial Regulation (IDFPR). – In this country, it’s good to kill an admiral every so often to encourage the others. We already have a number of other firms in our cross-hairs, and we’ve called specific instances of what we consider illegal behavior to their attention. We’ll continue to do that, to afford them an opportunity to clean up their act – and as evidence that a failure to do so amounts to willful disregard of the law. If you’ve previously worked for a firm you consider one of the dirtiest dozen – or are currently employed by one – and are willing to share relevant inside information about their operations, send an email to yojoe at yochicago dot com or call me at 312-280-9780 x 100. I won’t accept information sent anonymously, but I will keep your identity strictly confidential. If you’re a landlord or management company that hasn’t given express written authority to rental services to advertise your property, join the Craigslist Apartment Cleanup. If going public is too much of a commitment, monitor rental service ads at Craigslist, hotpads, Trulia and Zillow and flag ads for your property that were placed without your authorization or that involve pirated use of your copyrighted photographs. You can also notify me that you wish to be a silent supporter of the campaign and have YoChicago staff monitor rental service ads for your property. If you’re in the market to rent an apartment, help yourself and other renters by flagging spam ads at Craigslist. Trulia, Zillow and hotpads have links to report / flag problems as part of each ad. Use them. If you’re a leasing agent who’s interested in complying with federal, state and local laws that affect online advertising, ask your managing broker to invite me for an office-wide on-site training session. What you learn might save you from incurring $10s of $1,000s in fines or a disciplinary action that permanently blights your future. Show your support for our efforts by liking our Craigslist Apartment Cleanup page at Facebook. NOTE: At the margins YoChicago competes with rental services for landlord marketing dollars, so we have a financial stake in keeping the competition honest. Make whatever you will of that.